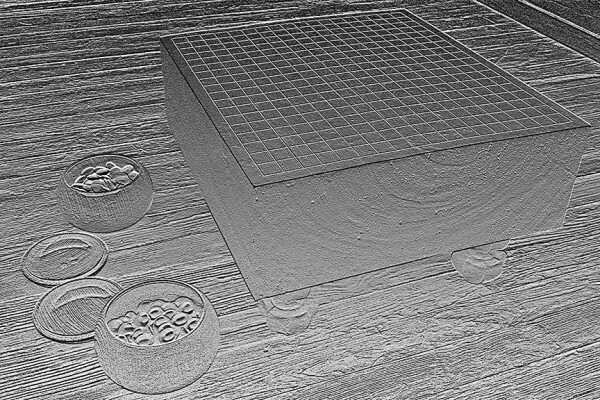 In the classical age of go, players would spend several hours or more playing a game. Ever wonder why they did that? What could they have been thinking about? Here’s an experiment for you: Go onto one of the turn based internet go sites, such as DragonGo, and start a game with someone at your level. 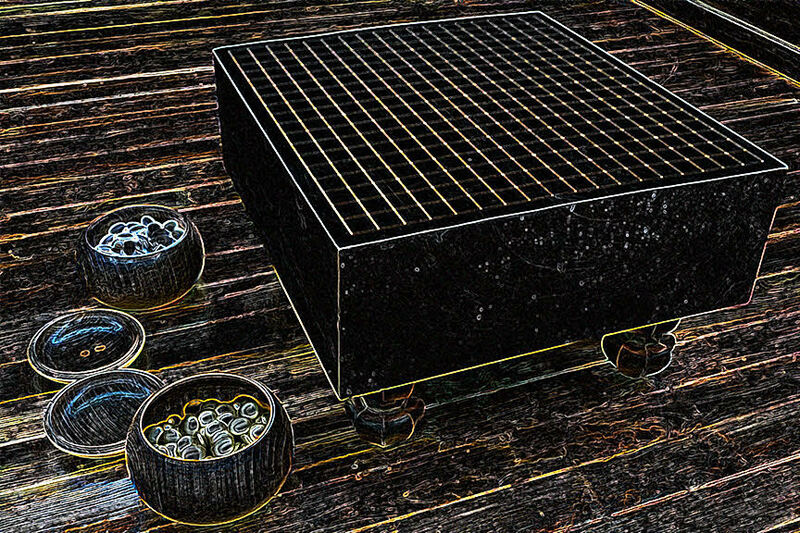 After the first four moves in the four corners, spend more than a few minutes after each move thinking about the board situation. Print it out and mull it over: where are the biggest plays, are there any weak groups, any ways to start a fight or disrupt the opponent’s plans, what is the balance of territory and potential, etc. Read out (even try out) possible sequences. Spend some time thinking about the game just to see what it’s like. 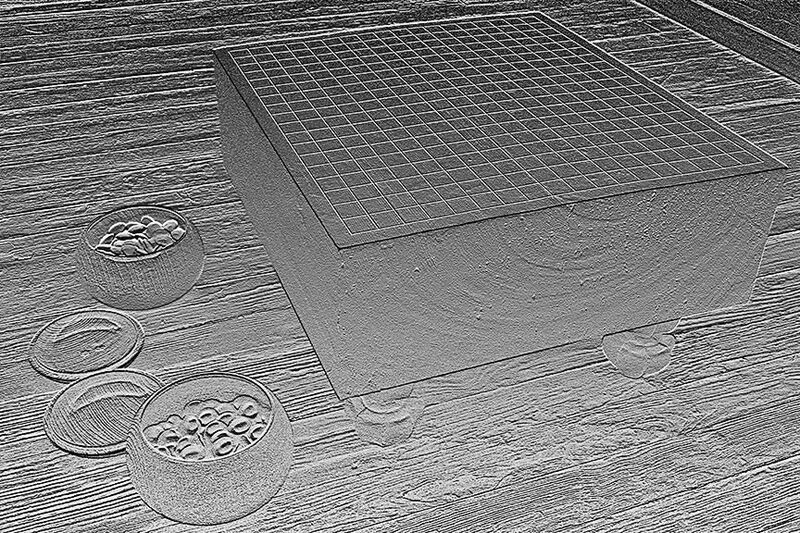 As the game develops notice what it’s like to not be under time pressure trying to figure out what to do. You’ll also discover that there are a lot more possibilities than you had noticed before. You’ll find times when you’re not sure what to do or whether a situation is good or bad and maybe you’ll even see why it might be interesting to read some books and study previous games, especially those of stronger players. Of course, this will also make you more frustrated about playing with only 45 minutes basic time, but at least you’ll get a better idea of what makes go such an interesting game. Except for the 90 minutes basic time of games in the US Open at the Congress, almost all official games in US tournaments have a basic time of 45 minutes. Why? Well, it makes it possible to have four rounds in a day. But why not have three rounds or two? Four rounds make it possible to separate the group for ranking the players for prizes and such. Anyway, most players don’t use the entire 45 minutes, let alone the 90 at the Open. Why? Don’t they have anything to think about in those extra minutes? They’re probably worried about running out of time, but perhaps having a ranking for getting prizes and status seems more important. So the whole idea of modern tournaments is primarily a function of catering to a desire to win prizes rather than to play the best go you are capable of? Yes. 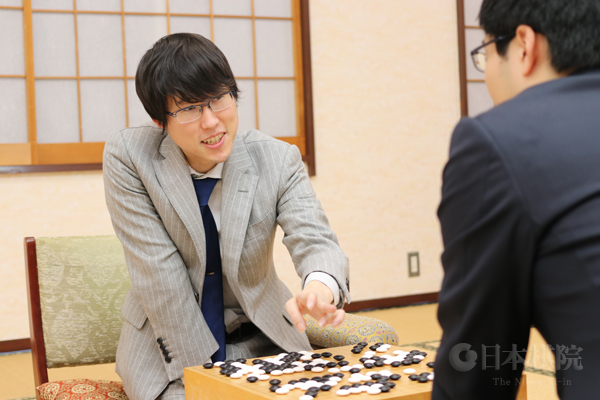 Yamashita Keigo becomes Honinbo challenger: Yamashita Keigo 9P turns 40 on September 6 this year, but he is still a member of a small top group that functions in Iyama Yuta’s shadow. At present, the other candidates for membership would be Murakawa Daisuke and Ichiriki Ryo, and players like Shibano Toramaru and Yo Seiki are vying to join it; Cho U (see next news item) is hoping to rejoin it. Members of this group were active in the final round of the 73rdHoninbo League. 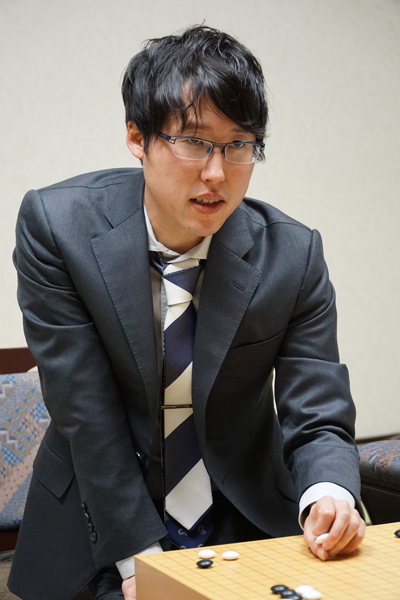 As the round started, on April 5, three players were still in the running to become the challenger: Yamashita, Ko Iso 8P, and Ida Atsushi 8P. 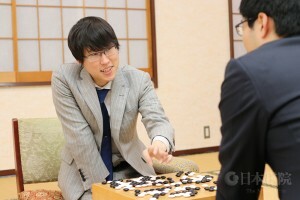 The possibility of a tie, requiring a play-off, seemed quite high, but Yamashita beat Ko and Ida lost his game, so Yamashita won the league outright on 5-2. Results follow: Yamashita (W) beat Ko Iso by resig. ; Shibano (W) beat Ida by resig. ; Yo (W) beat Kobayashi Satoru 9P by resig. ; Motoki Katsuya (W) beat Hane Naoki 9P by resig. The most disappointed of these players could be Ida, who won his first four games, taking the sole lead, then fizzled out with three losses. In contrast, Yamashita had reason to be happy, because he started out with two losses in the first three rounds and must have thought he was out of the running. Ko Iso (4-3) came second and retained his place because of his original ranking at no. 4. Motoki (3-4), Hane (2-5, and Kobayashi (2-5) all lost their places, but on the day there was no third- or fourth-place getter in the league. It’s a long time since this last happened. 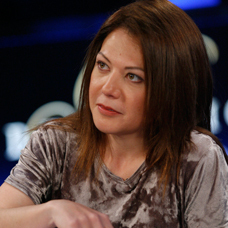 In 1999, there was a play-off among three players for one seat; the last time three players competed for two seats was in 1972. It became less likely in 1978, as in that year the system of ranking players according to their results in the previous league was adopted; only the four “newcomers,” all ranked #5, could now figure in such a tie. That’s what happened this year, presumably for the first and only time. Three of the league newcomers, equally ranked at no. 5, tied on 4-3, so there was a complicated play-off. This was decided by drawing lots to offset the unfairness of the fact that one player will get two chances. 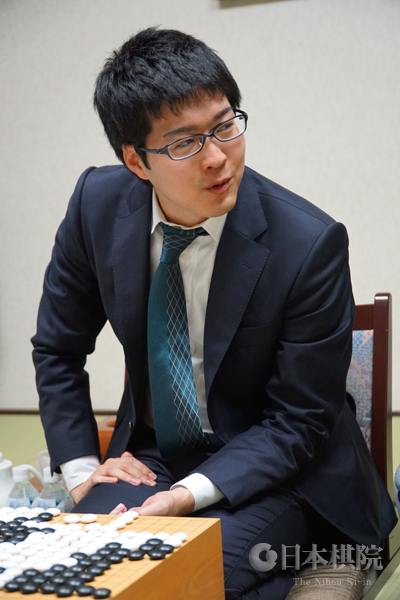 First, on April 12, Ida played Shibano; taking white, the latter won by 4.5 points, so Shibano keeps his place. Ida will play Yo on April 2, with the winner getting the fourth place. Yo drew the booby prize, that is, he gets just one chance. The title match starts on May 15. 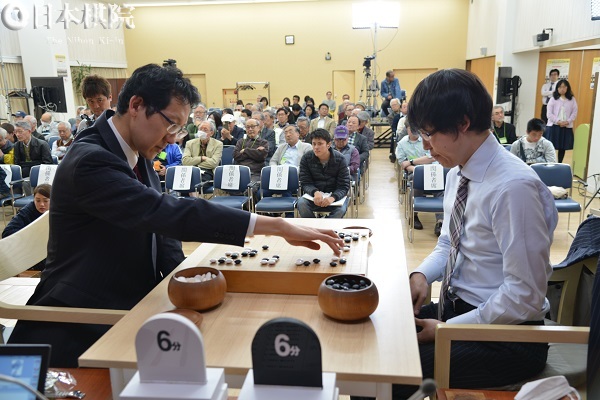 Cho U takes sole lead in Meijin League: The first game in the fifth or April round of the 43rd Meijin League was played on April 5. Taking black, Cho U 9P (B) beat Kono Rin 9P by resignation. A second game was played on April 12, with Yamashita Keigo 9P (W) beating Ko Iso 8P by resig. Cho now has the sole lead in league, though his nearest rival, Shibano Toramaru 7P, can join him if he wins his fifth-round game. Perhaps Cho is finally coming out of his slump of recent years. Usually the league is dominated by the top-ranked players, but this year they are doing badly. Numbers 1 to 3 are Takao, Yamashita Keigo, and Murakawa Daisuke 8P; Takao and Murakawa are on 1-3, which comes close to putting them out of contention for the challengership, and Yamashita is on 2-3. No. 5 Kono is on 2-2, and no. 6, Ko Iso 8P, is on 1-2. The two newcomers to the lead besides Shibano are Hane Naoki 9P, on 3-1, which puts him in third place, and Yo Seiki 7P on 1-3. 8th Huanglongshi Cup starts: The 8th Huanglongshi Cup, a team tournament for five-woman teams from China, Korea, and Japan, got off to a start in Taizhou City on April 9. Unlike the Nong Shim Cup, two games a day are played on the first two days, then one on the third day, then two on the fourth, making a total of seven games in the opening round. The time allowance is one hour per player, followed by byo-yomi of one minute per move. 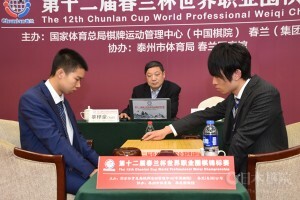 The first round was dominated by Li He of China, who scored five wins. The second round starts on June 5. (April 9) Nyu Eiko 2P (Japan) (W) beat O Cheonga 3P (Korea) by resig. ; Li He 5P (China) beat Nyu. (April 12) Li beat O Keii 3P (Japan); O Yujin 5P (Korea) beat Li. Iyama defends Judan: The third game of the 56th Judan title match was held at the Kuroyon Royal Hotel in Omachi City, Nagano Prefecture, on April 12. 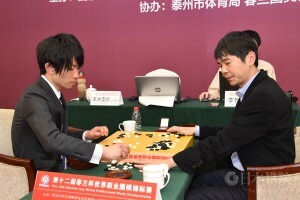 Taking white, Iyama Yuta (right) won by 4.5 points after 234 moves. Iyama has now won this title three years in a row and for the fifth time overall. 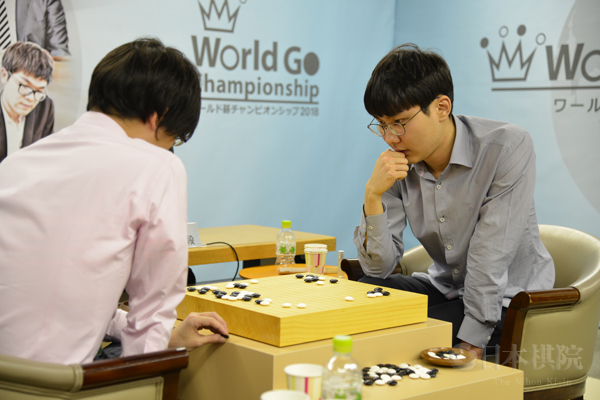 The defeated challenger Murakawa Daisuke (left) commented: “Compared to the previous two games, this one was the most regrettable.” In other words, he has some winning chances. According to the Go Weekly commentary, the game was even after the first major fight, involving a ko, ended in a large-scale trade, but in a subsequent border fight, Iyama found a clever move that secured more territory than the spectators had been counting for him. The Grand Champion tournament doesn’t seem to be counted as an official title, so the Judan is Iyama’s 51st title. Incidentally, he has now won 17 games in a row in title matches. Chunlan Cup starts: The Chunlan Cup is a Chinese international tournament held every two years and sponsored by the Chunlan Group, which started out manufacturing electrical goods and which is said to be one of the 50 biggest industrial groups in China. The first two rounds of the 12th Cup were held in Taizhou City, Jiangsu Province, on March 21 and 23. Five young players from Japan took part; four of them were eliminated in the first round, but Motoki Katsuya picked up a win he will remember all his career when he beat the legendary Lee Sedol of Korea by 3.5 points. However, he was eliminated in the second round. Five Chinese and three Koreans made it to the quarterfinals, including the world’s top two, Park Junghwan and Ke Jie. Full results are given below. We do not have a date for the quarterfinals. Round 1 (March 21): Kim Jiseok 9P (Korea) (B) beat Ichiriki Ryo (Japan) by resig. ; Motoki Katsuya 8P (Japan) (B) beat Lee Sedol 9P (Korea) by 3.5 points; Xie Ke 5P (China) (B) beat Kyo Kagen (Xiu Jiayuan) 7P (Japan) by resig. ; Peng Liyao 5P (China) (W) beat Shibano Toramaru 7P (Japan) by resig. ; Kang Dongyun 9P (Korea) (B) beat Yo Seiki (Yu Zhengqi) 7P (Japan) by resig. ; Lian Xiao 9P (China) (W) beat Chen Qirui 5P (Chinese Taipei) by resig. ; Dang Yifei 9P (China) (W) beat Shin Jinseo 8P (Korea) by resig. ; Pavol Lisy 1P (Europe) (W) beat Eric Lui 1P (North America) by resig. Round 2 (March 23): Gu Zihao 9P (China) (W) beat Motoki by resig. ; Dang (B) beat Tan Xiao 7P (China) by resig. ; Chen Yaoye 9P (China) (W) beat Lisy by resig. ; Xie (W) beat Tang Weixing 9P (China) by resig. 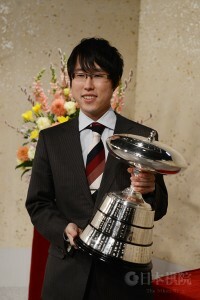 ; Park Junghwan 9P (Korea) (W) beat Peng by resig. ; Ke Jie 9P (China) (B) beat Kang by resig. ; Kim (W) beat Xie Erhao 9P (China) by resig. ; Park Younghoon 9P (Korea) (B) beat Lian by half a point. 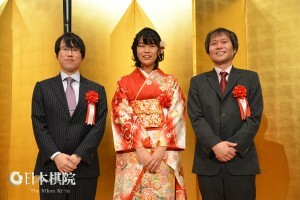 Ueno receives prize: The photo shows Ueno Asami at the Prize Ceremony for the 21st Women’s Kisei title. Ueno won it on January 29 this year by defeating perennial women’s champion Xie Yimin 2-0. At 16 years three months, she became the youngest-ever holder of this title. The award ceremony was held at the Tokyo Dome Hotel on March 28. In the photo, Ueno is flanked by Iyama Yuta (on the left), who gave a congratulatory speech in Ueno’s honor, and Takao Shinji, who proposed the toast. Ueno’s bright red kimono, a furisode, which is worn by unmarried women, matches the youthful optimism of the new titleholder. Iyama wins 2017 Grand Champion tournament: The Grand Champion tournament is a tournament for all the current titleholders plus some of the top players in the prize-money list. The semifinals and semifinal of the 2017 version were held on March 31. The semifinals were played in the morning. Kono Rin 9P, playing white, just barely managed to edge Ichiriki Ryo, winner of the previous tournament, by half a point. In the other game, Iyama Yuta (W) beat Motoki Katsuya 8P by resig. Iyama later commented that he was lucky to eke out a win in this game. 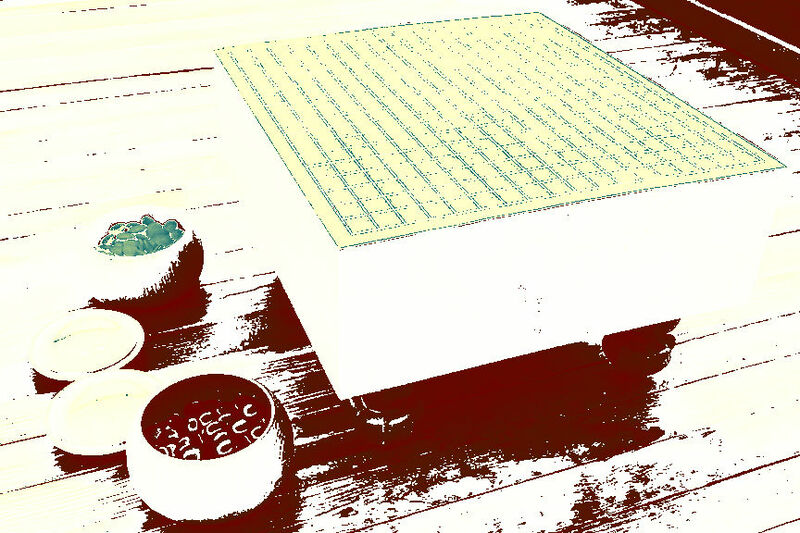 The final was played in the afternoon and telecast on the Igo Shogi Channel and also relayed on the Nihon Ki-in’s net channel Yugen-no-ma. Taking black, Iyama secured a resignation after 195 moves. In the key fight of the game, Iyama flattened out White’s moyo; some white stones cut off his group, but he set up a one-eye vs. no-eye capturing race with them, so this was a big gain. Michael Redmond 9p, hosted by the AGA E-Journal’s Chris Garlock, reviews the eighth game of the new AlphaGo Zero vs. Master series. 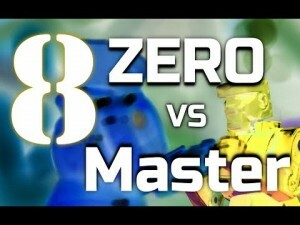 “Zero just doesn’t care about its opponent’s moyo,” says Redmond. “It can do anything inside the moyo. Human pros who have tried to emulate this strategy have just crashed almost every time. Miserably. But Zero has no trouble dealing with its weak groups, so in this game we’re going to see a lot of dancing around inside Master’s moyo. Plus a really weird endgame.” Redmond also has some interesting observations about the similarities — and differences — between top human players and AI players. 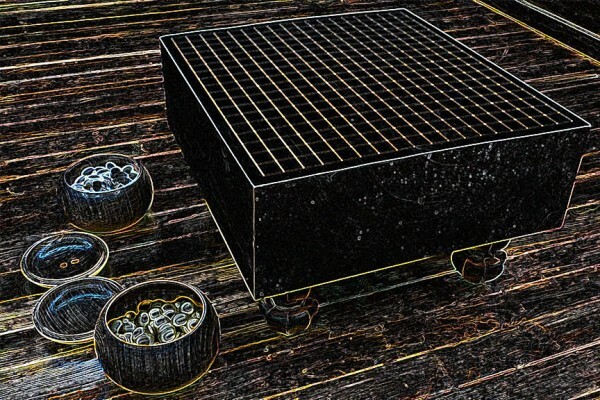 When I was a student at the Korean Baduk Academy, I was firmly ensconced in the “B League” at 6 “gup”, or “kyu”. The way the ranking system worked is that a 6 kyu would give a 5 kyu only three points of komi for White, rather than 5.5 or 6.5 points. 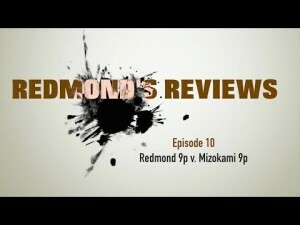 It then went no komi, 3 points reverse komi, then 6 points, then 9 points reverse komi. The two-stone handicap gap was considered so big, you didn’t get there until a 6 kyu was playing against a 1 dan (that’s 1 dan pro). Clearly one rank did not equal one stone. The general go-playing population, even in Korea, didn’t know or use this kind of system. At best, you’d see the strongest players say something about being “1 gup.” There was whispering that there was such a thing as an amateur dan, but it was hard to confirm the rumor, unless you met someone who had “Amateur 4 Dan” or something like that printed on a business card. This was a signal that this person might do something completely bizarre in Korean society, like sit in a seat of honor at a banquet. Also that this person had no intention of ever exceeding this rank. Or else his family owned the banquet hall, and was paying for the whole shebang. That’s why “gup” doesn’t exactly translate to “kyu.” Basically, strap in to your seat if the person says he or she is any “gup”. This is reminding me of when I was introduced as a “Korean 3 dan pro” to Yoda 9 dan at a banquet. He looked mildly interested, perhaps concerned, until someone whispered, “Not one of those Korean 3 dan pros.” Note that being female had nothing to do with it, it just had to be established I was not Lee Sedol, who was also 3 dan pro at the time. It was so hard, during the peak of the AlphaGo phenomenon, to talk about things. For example, one did not want to tearfully start screaming, “You don’t understand how big a two-stone handicap gap is, that’s not even something we ever did!” when somebody started suggesting handicaps for pros against AlphaGo. Don’t get me started on winning percentages, like people of a certain skill level couldn’t just be relied on to calculate their reverse komi or whatever in a game, and play sub-optimally to win. Or like AlphaGo had invented something novel in not caring about the size of the win, or altering the strategy depending on the situation. So there I am on the bus, which could preface a significant chunk of my entire waking life in Korea. Somebody is looking at me with my nose in my life and death book, and announces, “That’s easy.” I’m startled. Is it possible that I’m missing something obvious? I thought it was really hard. “Black lives”, my seat mate says. Well, yes. It says that right on the problem. But how? I’m suddenly furious. When we get to my stop, I insist, practically pulling on the man’s sleeves, that he get off at the same stop, and accompany me to the Korean Baduk Association building. There I crush him in a game, in the most stupid and mindless way possible. He apologies profusely, and runs, literally runs, for the door. The 6 gup, full of ego and self-doubt, crushes this nice man, guilty of nothing more than trying to be helpful to the young girl looking at a go book on the bus. The 3 dan teaches this man how to play go, but he already knows how. There is a game-changing difference between them. Like a 2-stone handicap. Here’s a link to the Blue Oyster Cult song “Shooting Shark.” The lyrics are funny, especially if viewed entirely in a go context. I picked a video that didn’t have inappropriate content, although G-d knows anyone can write anything in the comments.